Integrated with the Expo Tracker Speaker Management System, the Abstract Center provides a user-friendly tool to identify prospective speakers, send email or printed invitations to submit abstracts. Prospective speakers upload abstracts and committee members view, score, and comment on each abstract. Each committee member has the ability to review the scores and comments, and based on their policy, the selected speakers are notified via email. Selected speakers complete their listings by uploading bio information, session titles, and other requirements. Show management then uses the system to build each session, indicating dates, times, seating limits, costs, and if the session is to be listed separately in the registration system. The end result is a searchable listing of each speaker or session. Sorted by date/time/location. Integrating abstract management, speaker/session management, and registration creates a very powerful tool for show management and saves a considerable about of time consuming work creating banquet service orders, session listings in brochures, or online listings. 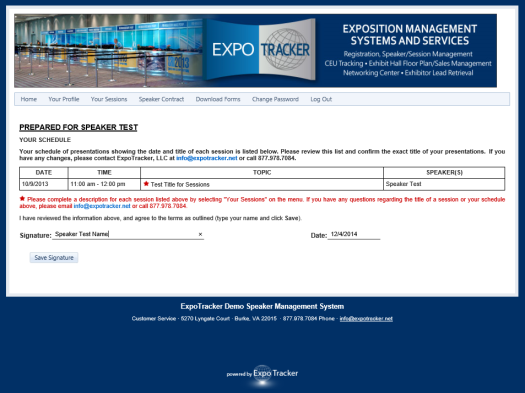 Copyright © 2014 Expo Tracker LLC. All Rights Reserved.